How many people would absolutely commit to purchasing a performance exhaust header system for their FT500? The system would not be complete with a muffler. It would only consist of the head pipes, down tubes & collector section. You would have to source your own muffler from either a Sports Bike, an EMGO reverse megaphone, or a Super Trapp universal muffler, etc. The exhaust is patterned after the old White Brothers Ascot pipe. I need an absolute commitment & probably a down-payment to place the order. Of course if the order was not completed for whatever reason your money would be 100% refunded. I know of a manufacturer that is sitting on a pile of these exhaust systems that are not 100% completed yet. He ran out of steam on finishing the project due to lack of sales. If we can show enough interest, I'm thinking we could get him to finish the pipes & sell them. Do you know how much he wants John? I believe the head pipes are in the $165 range. I need to verify that for certain though. I'm just trying to see how much interest there would be. Here are a couple of pictures that show how close the pipes follow the frame. Here are a few more pics that show some different muffler options. I more than likley would be interested once all the facts are known. Interesting looking exhaust system. From the photos included it appears that the head pipes join in front of the crankcase (ahead of the stock joining point of the head pipes). I assume that these are single wall pipes. Any dimensions--head pipe ID, intermediate pipe ID, outlet OD, ect? How many separate pieces are there, or is the header system all one piece? If you could nail down an exact price that would help. Probably the more sets ordered the lower the price?? Thanks for all the work on this!! The header assembly is single wall & is a copy of the White Brothers pipe, which I believe was a copy of the HRC pipe. The header is one piece if I understand correctly & then you add the muffling section of your choice. This new pipe is already finished with a ceramic type of coating. I'm still trying to collect more facts & maybe I can get the manufacturer to reply directly to the forum. I will be e-mailing a link to this post directly to him. He doesn't mess with the computer much, so we'll see. 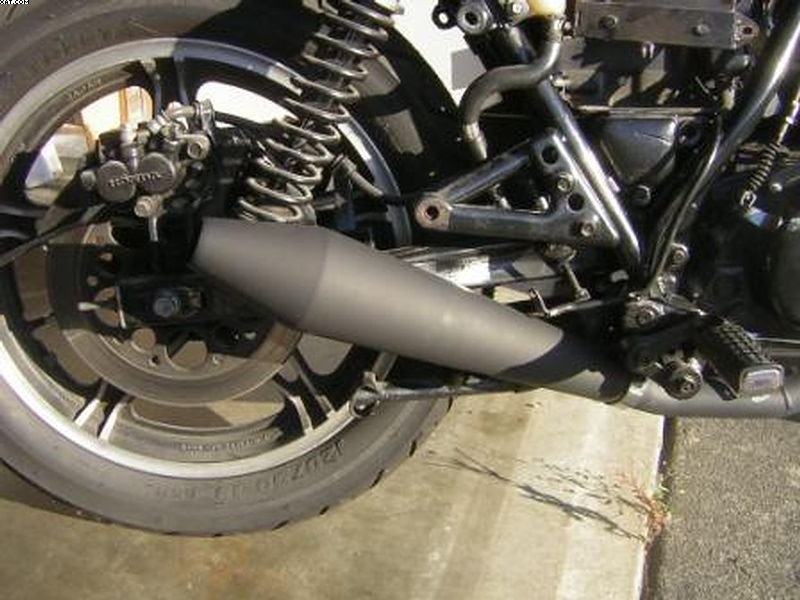 J6G1Z, any info on what this muffler is or where to track one down? That's the EMGO reverse megaphone. I have one on my hybrid bike & it's loud. It's a straight through design with a perforated core, but I don't think there is much to any sound damping material inside. EMGO also has a reverse megaphone that the end comes off so you can re-pack the sound damping material. I would commit to a system even though it would have to be shipped to the UK. I touched bases with the manufacturer about a week & a half ago. He's finally in a financial position to approach a few machine shops to get quotes on the finish grinding or cutting that needs to be performed. Hopefully he will have some pipes ready to be sold in the next month or two. Meanwhile anyone who is interested, needs to start saving up so you will have enough money to place an order soon. It will be somewhat embarrasing to me if I'm the only one that places an order. I need to save up for two of them. Keep in mind that the original header pipes on our Ascots are dual wall tubing. They are notorious for having rust develop in between the tubes to the point that the two tubes seperate & begin to rattle real bad. So far, I've been lucky & both of my bikes haven't suffered this fate, but it's only a matter of time. Another thing to keep in mind, is that this is THE last run of after-market performance headers for our bikes. After these are sold, that will probably be the end of availability. Great to hear J. I just started to notice some rattle from my pipes since I've been wearing a 3/4 shell helmet around town now. Yep, It happens. You can fix it by cutting some small holes on the backside of the tubes where you can't normally see them. Then weld the inner tube to the outer tube through the holes that you cut. It's a band-aide, but it's the easiest way that I'm aware of to cure the rattle. As soon as I can come up w a bike! Wonder if I cant get an FT and have to end up using a XL/R500, how much modification to make it fit that bike? Are you asking if the exhaust will adapt to the XR/XL500? If so, there is probably a pipe still available for the XR/XL bikes as they made a whole lot more of them. Try checking out XR's Only, Super Trapp & Powroll to name a few possibilities. DonDDR, What type of project bike are you envisioning? It may be that an XR or XL would be a better donor or foundation. Ah, to clarify, I was going to us a XR/XL bike for double duty. Looks like I can run one as a flat track and supermoto bike. Wont really fit into a main stream class but cause I am "older" I can run in the 40 yr old guy classes which is cool. I have raced my F2 at PIR and done some drag racing. I just want to try a new racing venue. Been looking for a XR/L bike and have not found much. I forgot about the Ascot till the other day in my searches for an XL/R. So if I do use an XR/L I need a low mount exhaust. Just seen this and I would also want one in the UK. Not sure if packing them together with combined shipping may be cheaper - then re-sending within the UK? That is unless shipping charges can be kept to a sensible level. I should probably call for an update. I called about a month ago & the manufacturer was ready to approach some Machine Shops to get some quotes on performing the final machining operation. I try not to bother him too much. As always... I will keep you guys updated. I just called Mark at ThumperStuff & he informed me that he would ship to the U.K. as long as you trust your local shipper. He guestimatted shipping to be in the $65 range. Please understand that shipping figure is not carved in stone & was just an estimate. THE REAL NEWS IS THAT HE IS READY TO ACCEPT ORDERS FOR THE NEW EXHAUST HEADER ON A FIRST COME, FIRST SERVED BASIS. Once you have placed your order, Mark will complete the final machining operation & then ship them out. Please contact Mark & place your order as soon as you have saved up enough cash. Well... I just placed my order for two sets of Headers. Should be here in about a week to a week & a half. They are selling for $170 each, and are ready for your order. Give Mark a call & reserve yourself a Header system while they last. I should be ordering mine by the end of the week. J is that 170 shipped or is shipping extra? I believe that shipping is extra. The $170 covers the ceramic coated Header & the exhaust gaskets.